The three judges for this 31st NATSIAA Award all come from the south; Tina Baum from the National Gallery, Clotilde Bullen from the WA Gallery and David Broker from the Canberra Contemporary Art Studio. Perhaps it wasn’t surprising that they found a fellow-southerner to take out the newly enhanced $50,000 Big Telstra? Or could there be something in the zeitgeist nationally? For it’s only a couple of weeks since the same Tony Albert received the Basil Sellers Sports Art Prize for a different work at the other end of this land, Melbourne – though it was also a compilation of small artworks and was also addressing the Attorney General’s once-favourite subject – Bigotry. I’ve no idea how the Sellers’ judges came to their conclusion, but, in Darwin, the trio were refreshingly honest about Albert’s work not being any of their personal favourites when they began work in the morning earlier this week, but it was something that simply grew on all of them as they discussed matters. Intriguingly, their personal favourites all turned up as Highly Commended rather than prizewinners – Gunybi Ganambir’s extraordinary transformation of Yolngu bark design to a massive sheet of metal recycled from a water-tank; Lily Nungarrayi Hargreaves acid-yellow ‘Turkey Dreaming’ canvas; and Owen Yalandja’s delicate transfer of his familiar Yawk Yawk statuary to a small two-dimensional bark. But Tony Albert’s panel of twenty photographs of Aboriginal boys’ torsos, each one ‘decorated’ with a red target, against a deep black background clearly created a wealth of moved responses that won the day. Albert himself had seized on an incident in Sydney’s Kings Cross when police had drawn their guns and shot at a car full of joy-riding teenage Aboriginal boys, wounding two, and subsequent demonstrations had included Black boys baring their chests and painting targets on themselves. But the Telstra judges went beyond this current affairs reading to add quasi-traditional interpretations including initiation, ceremonial body-painting, the tribalism of the group and the different shades of Black revealed. They also admitted to emotional responses involving mothering (the women) and gay appeal (the man). They were also in tune with the Museum & Art Gallery of the NT (MAGNT) which organizes the event, and which had added a new Youth Prize this year. As Clotilde Bullen, the curator from WA put it, “A lot of young Indigenous people are deciding this (art) is the way forward; and Tony Albert, with his sophisticated use of technology, is an inspiration to them”. Perhaps the one factor that might have told against Albert was the fact that the judges also revealed that they were really looking for innovation in their prize-winners. And Albert had shown work like this before in Sydney. But, even here, the artist himself explained that he’d previously shown a limited number of selected images. But here he was reflecting the collaborative nature of his project by showing all the boys who had modeled for him “I didn’t want to let anyone down at this important forum”, he insisted. It’s only the second time he’s entered the Awards – which have been resisted in recent years by artists unprepared to commit to being ‘Aboriginal artists’, rather than being artists who also happen to be ‘proud Aborigines’. But Albert has had a few years travelling, and felt that he was big enough now to “re-enter the market” at this specifically Indigenous event with its long and important history. Given that history, it was almost a cause for regret that a prize that had been almost exclusively devoted to bark art 31 years ago now only five bark finalists. But the judges insisted that this was a reflection of entries, not their taste. And of course, Ganambarr’s fabulous metal work was bark-derived, and, arguably, an influence on the winning bark by Garawan Wanambi. 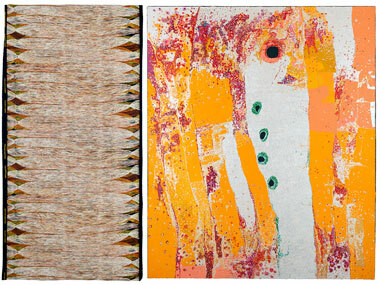 For Wanambi’s very personal choice of pastel pink and cream ochres and his erratic patterning of his clan’s diamond miny’ti designs to tell of an aggressive mosquito ancestor at the point where land meets the waters and the fresh water meets the sea appears to reflect some of the younger artist’s innovative spirit. Personally, I’d have found it hard to go beyond Nonggirnga Marawili’s wild bark which hit the eye right from my entrance into the exhibition through the drama of the 65 finalists’ hang. For she was painting that unique Yolngu vision of lightning rising from the serpent’s mouth, not striking from the skies, with extraordinary power; the power, one might suggest of the tiny community of Gangan – just 10 houses, producing nine major art-prize winners in the past decade or so. Is there anywhere in the world to match it? The three other major awards all went to masters. Young Daniel Walbidi from Bidyadanga on the coast south of Broome has created his own vision of the deserts from which his family came that brings Klimt and Schiele to mind in its use of gold and silver glitter to capture the light of desert salt-pans. In ‘Wirnpa and Sons’ (don’t you love the idea of a water-hole having offspring!) he’s taken it to mighty proportions. The almost-as-young Alick Tipoti has brought the Torres Strait to the world in ever-larger and more exciting form since he moved from lino-prints to fiberglass dance mask-making. 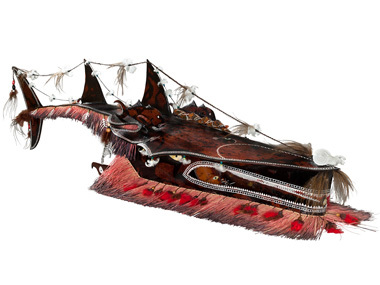 His 3D winner must be two metres long and takes the form of a shovel-nose shark mask, embellished with all sorts of birds, fish, feathers and string and is as ever rooted absolutely in TSI mythology. For this shark disturbs the sand in the shallows as it feeds, creating trails that Islanders see as a reflection of the myriad stars above in the Milky Way. Meanwhile, South Australian photographer Nici Cumpston has left behind her Murray River red gums to explore her Barkindji/Afghan mother’s country out of Broken Hill, where a Scar Tree stands proud in the sands representing the thousands of years of Barkindji possession before that land became a white ‘property’ in the Nineteenth Century. The Black and White tree is set in wildly crayoned country – almost graffitied – in a new style for Cumpston, not unrelated to the deadline for entering the NATSIAAs coming in the middle of a madly busy time for the artist/curator who’ll also bring us a truly national Indigenous festival in Adelaide next October. Where do young artists emerge from? Out of thin air is almost the only conclusion I can come to after my amazement at finding so many new names in this year’s Awards. A few emerged from the new Youth prize, of course – headed with no uncertainty whatsoever by the Daly River’s Kieren Karritpul, whose painted cloth hanging showing the patterns of ancestral pandanus weaving simply seized the eye. But as large and as brave was Daniel O’Shane’s Torresian print about Papuan sorcery, Betty Bundamurra’s canvas from the East Kimberley showing a two-bodied Kwini ancestral hero, and Jessie Victoria Bonson’s mesmerising photo of a man’s painted-up back, simply called ‘Hunter’. So many more hits and very few misses – and there’s still the Salon de Refuses (now in its second year) to come to attempt to spot what the judges missed! But its time now only to briefly reflect on MAGNT’s newly empowered Chairman’s thoughts. For Allan Myers – Melbourne lawyer, Northern property man and Chair as well of the National Gallery and the Gratton Institute – has succeeded in separating the Darwin institution from the clutches of the NT Government as an independent statutory body, which came into existence on July 1st. His clear view is that the government retains the duty to pay for the running costs if it acknowledges the need for such an institution in the community. “But the art has to be provided by the people, I believe”, he said. “And, while the current building (a $10 taxi-ride from Darwin’s CBD on a splendid water-side setting) is the perfect place for a natural history museum (which MAGNT also is), the art needs a permanent and separate building of its own in the town centre, where people – locals and tourists – can value it alongside the institutions of government. Only then can it really collect, conserve and display the art that can serve to illuminate life for viewers”. And a tip from the Chair. “The jewell in MAGNT’s crown”, the serious collection of early Papunya boards that the Darwin Museum bought when no other art institution would give them the time of day, should be fully on show next year – somewhere. That will make Darwin a Destination.